More Paówer to your posture! 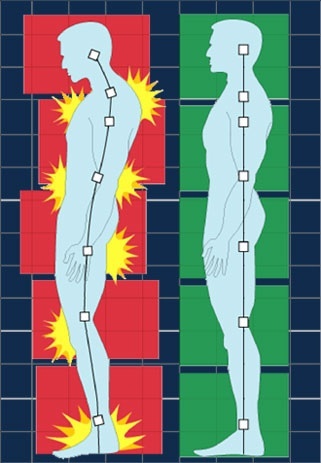 Are you satisfied with your posture? Nearly everybody at one time or another wonders if they’re slouching too much: whether it is bad for their back, or even how it makes them appear to other people. We Pyramidionites are no different, so when we discovered HighTechXL start-up Paó Wearables is developing a posture awareness device we stood up straight and took notice. Research shows that as well as influencing our physical wellbeing, posture affects how we feel about ourselves, and how others see us. For example, a ‘proud’ upright posture can make us feel more confident, leading to improvements our performance. So, by helping you track, maintain and transform your posture, the ‘Paó’ device contributes to both physical and emotional fitness, and can thus improve your competence in all your daily activities. Paó offers wearers feedback on their posture, e.g. if they are slouching unnaturally. The device is wearable and gathers data at different times and during different activities. An advanced algorithm uses the data to draw conclusions about the user’s posture, and offers guidance when it needs to be corrected. Paó’s algorithm is being taught to interpret between posture and deliberate movements. For example, it will distinguish between slouching and when you bend down to pick up an object. The device is self-sufficient or it can be used with a smart phone. An open API means others can freely develop apps using Paó. While delivering a very useful function, particular attention has been paid to how Paó looks.Because it is worn in social settings as well as at home, image is considered very important. So as well as helping improve someone’s lifestyle, Paó is a stylish wearable, maybe even a fashion object for the new age. As Paó Wearables begin to take their novel device from the prototyping stage to the marketplace, we are sure investors will be bending over backwards to offer help.